TFMS 018: Couple on the Run Andrew & Sue O’Brien Run 8 Marathons in 8 Weeks in 8 Countries! 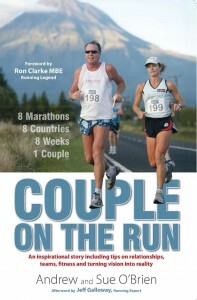 The Fit Marriage Show welcomes Andrew and Sue O’Brien authors of Couple on the Run. They have a remarkable story as a couple who found a passion to run and to run together! Over the course of many years, they have learned a lot about partner running and in this interview they tell it all. Running is therapeutic for many as they clear their minds and challenge themselves. Andrew and Sue found that they too enjoyed running, but really found the most pleasure while running together. The connection they had wasn’t for one or the other to finish first, it was the joy and sense of accomplishment they had by crossing the finish line together. The knowledge about partner running that Andrew and Sue bring to TFMS is sure to get you thinking about how to do it with your spouse. They also share how their relationship has grown by participating in partner running as well as coming together to complete 8 marathons, in 8 weeks, in 8 countries. Don’t miss this Couple on the Run!